Though I only lived in New York the first decade of my life, going back to visit always feels like returning home in a way that I can’t explain. It’s as though everything is the way it’s supposed to be. My parents are from New York as are my uncles, aunts, grandparents and fifty-eleven cousins. The New York runs deep in my clan and I try to visit as often as I can. One of my favorite things to do in New York is eat. The food in New York is like none other. While I appreciate a fancy multi-course meal like the next fine dining fan or food snob-in-training, those meals often come at a snooty price and I’m on a tighter budget these days. Luckily, there is plenty to eat in New York at non-frightening, down-to-earth prices and I took advantage during my latest trip to New York. I never leave New York without having a slice of pizza. Our first night in the city, my sister C__ and I headed to the West Village to chow down at John’s Pizzeria. So happy. (And tired, this was taken after a 5.5 hour plane ride for which I had to wake up at 5:00am. Travel to the East Coast from the West Coast is exhausting. 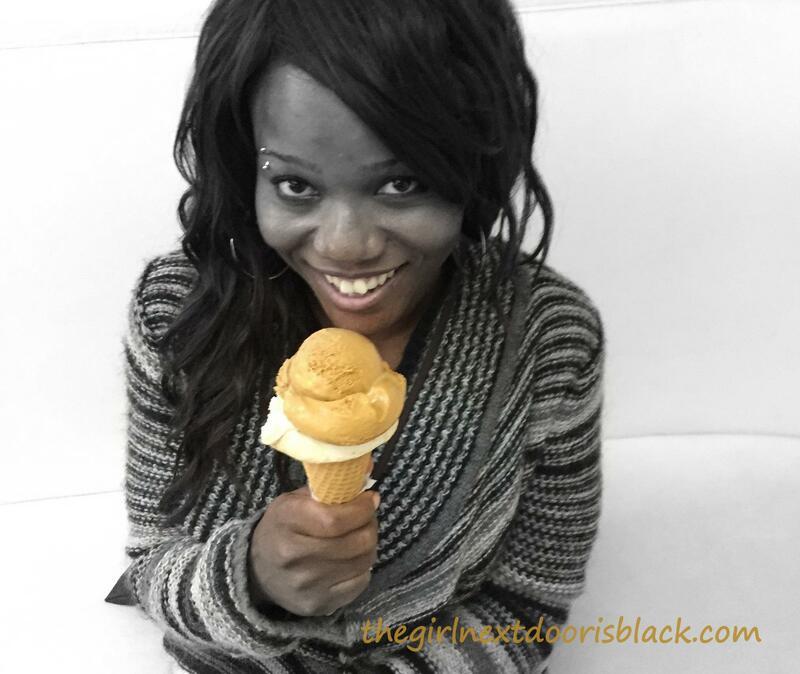 Both delicious, creamy ,and rich. I love diners, especially if the food is good. We stumbled on a quaint one in Tribeca called The Kitchenette and their menu full of comfort foods. The food wasn’t mind-blowing, but it was good and I dig the decor and ambiance. Desserts at The Kitchenette include pies, cupcakes and creme brulee. This is me before the waiter told me my breakfast didn’t come with grits, like he originally told me. Meatloaf and mashed potatoes. The gravy was tasty. The Kitchenette – Bacon, egg and cheese breakfast sandwich. The muffin fell apart pretty easily, I was expecting to be able to eat it as a sandwich, but it required a knife and fork. Not bad, but not great. My parents are big fans of Junior’s Cheesecake and passed the love down to me. While the Times Square location isn’t a replacement for the original Brooklyn spot, it’s a good substitute. It’s situated smack in the center of the Broadway district and they’re open late, so it’s a great place to catch a post-show meal. I love that in New York I can get a hotdog with sauerkraut; add spicy mustard and it’s my favorite way to eat one. 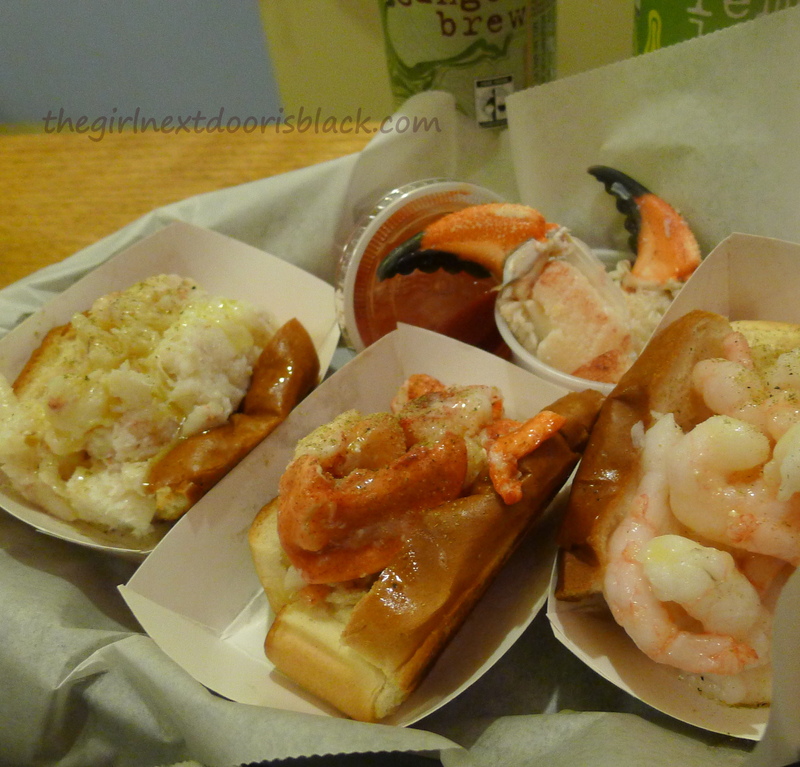 I first visited Luke’s Lobster a few years ago after finding out about it from the show Food Feuds. It won the challenge against another Manhattan restaurant famous for it’s lobster rolls, Ed’s Lobster Bar. While I’m no lobster roll expert, Luke’s Lobster roll is the best I’ve had, so the small restaurant required a return visit! Crab, Lobster and Shrimp Rolls – the crustaceans are flown in from Maine. Dee-licious! (I’m cheating a bit with this pic. It is from my first visit to Luke’s. My current day photo didn’t turn out well. The content remains the same though. ). 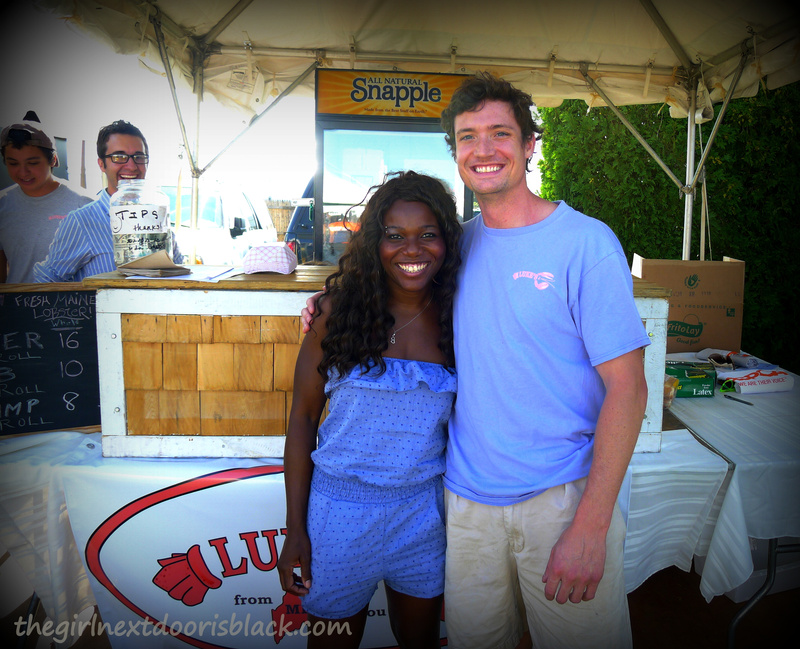 Side note: I randomly met the owner of Luke’s a few summers ago in The Hamptons. With Luke Holden, investment banker turned restaurant owner of the Luke’s Lobster chain. I recognized him from the lobster roll episode of “Food Feuds” and seeing him during one of my visits to his restaurant in NY. I was too embarrassed to ask for a photo with him, so my sister N__ did it for me: “My sister wants a picture with you. She thinks you’re cute.” I was even more embarrassed. He was very game though and even jokingly (?) asked if I wanted his number. His employees (in the background) were very amused by his newfound notoriety. 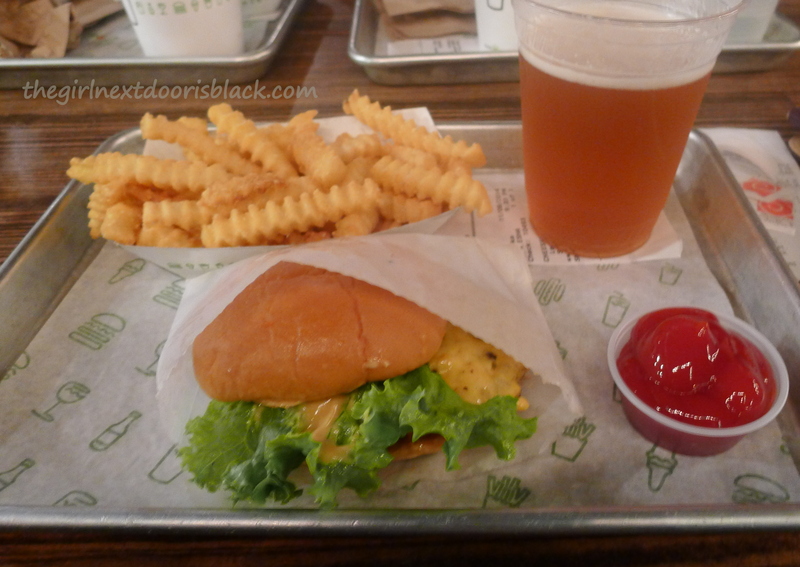 I love a tasty, juicy burger and Shake Shack’s burger is one of my faves. The crinkle-fries are a bonus. I never have enough room for the shakes or the frozen custard they are also known for. I’ve had a taste of both though and they are equally delectable. ShackBurger with cheese, crinkle-cut fries and ShackMeister Ale. As a giant Golden Girls fan, when I saw the “Bea Arthur” on the menu at the Big Gay Ice Cream shop, all the other options fell away. It was about me and Dorothy Zbornak. Me and Maude. In a little less than five days, my sister and I walked nearly 15 miles all over New York City. This is a good thing considering how much we ate. Still, I didn’t get to hit every spot I wanted to. We did have to leave room for non-pigging out activities! I guess I’ll have to go back to New York soon! If you can, I recommend a visit to New York City at least once. It’s a unique city. I’d love to go to New York. I always heard such go things about the pizza. And boy those lobster rolls sound amazing. Making me hungry! Yes, New York is a must! The city isn’t for everyone, but I think if you can visit at least once, it’s worth it for the experience (and the food)! Ah! 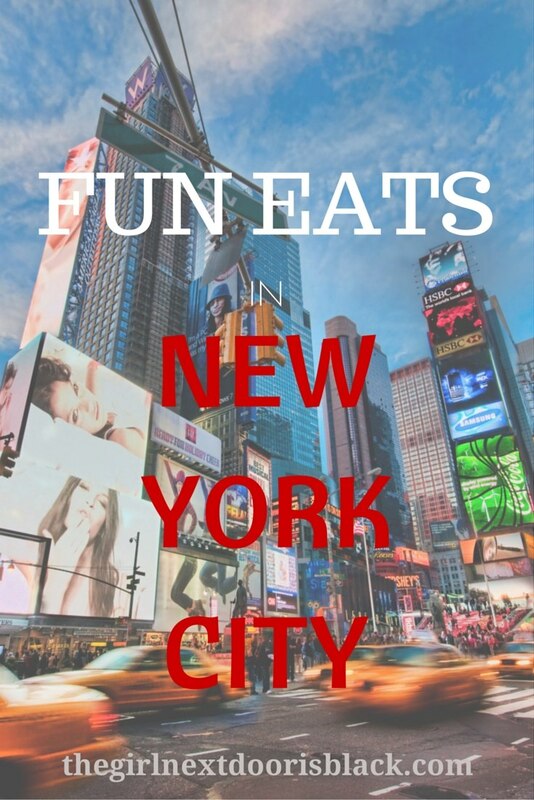 My sister in law is over in NY at the moment, so I will have to send her this blog post so she can have some more awesome eats!! Awesome, I hope your sister finds this useful. Thanks for the heads up! I hope that you are recovering well from surgery, Talia! I could never leave NY because of pizza and bagels done right! Yummy! We are hoping to visit NYC in 2015. I am pinning this so I can remember all of these wonderful places. Awesome! Will it be your first visit? I loved NYC so much when I visited 2 months ago! It was very much my foodie paradise 😉 I never went to Juniors but I had my eye on their cheesecake each time I walked by the concession in Grand Central! I loved your gravatar and your blog is super cute. Looking forward to reading some of your posts. I definitely recommend Junior’s Cheescake – even better if you can get to the original BK location. Mmm. 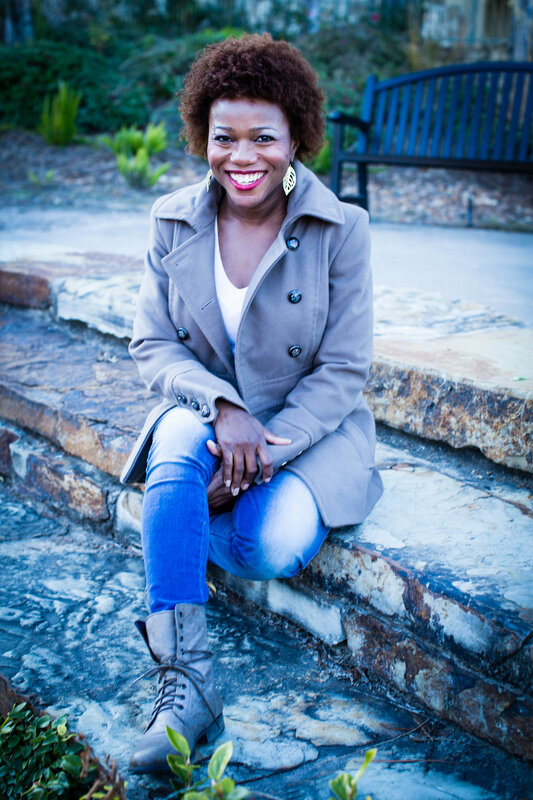 Nice photos and beautifully written! I was in New York around the time you were there! I wish I knew! I hope all is well ! Aw man, just missed you! Were you there for fun or work? Great food pics! It all looks so yummy!! Thanks! It was all delicious. I hope the memories will be enough to tide me over until my next trip! Hope you can come back to NYC soon! I love all the places you mentioned here! Yumm! That means a lot coming from someone who lives there. 🙂 Thanks for your comment!